Warning! You may be looking at the best quarteback in Ball State history. You may also just be looking at a quarterback simply holding his mouthpiece before a snap but who are we to judge. A year and a half ago, I was stuck in the same music history class (many hours I will never get back in my life) with Ball State defensive end Robert Eddins. Eddins would later sign with the Buffalo Bills. I was the only one in class who recognized him, which is shocking as he stood out like a sore thumb in the room full of tiny underclassmen. Ball State had just lost to FCS Liberty at home and had a quarterback controversy between Keith Wenning and Kelly Page. I asked Eddins during a break who he thought would start the next game at Purdue. He said Wenning, but what he said next made my jaw drop. “I think he’ll be just as good as Nate Davis,” Eddins said. Those were some strong words coming off the loss to Liberty, possibly the low point of the Stan Parrish era (also known as the 7th ring of football heck). 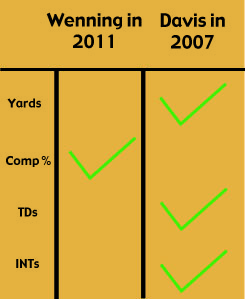 After the 2011 season we finally have enough statistics on Wenning to make a comparison. I only examined the sophomore seasons of the two quarterbacks as it would be unfair to compare Davis’s junior season when Wenning only has two years under his belt. Davis threw more touchdown passes and more yards his sophomore year than his junior season but did have a higher completion percentage in 2008. 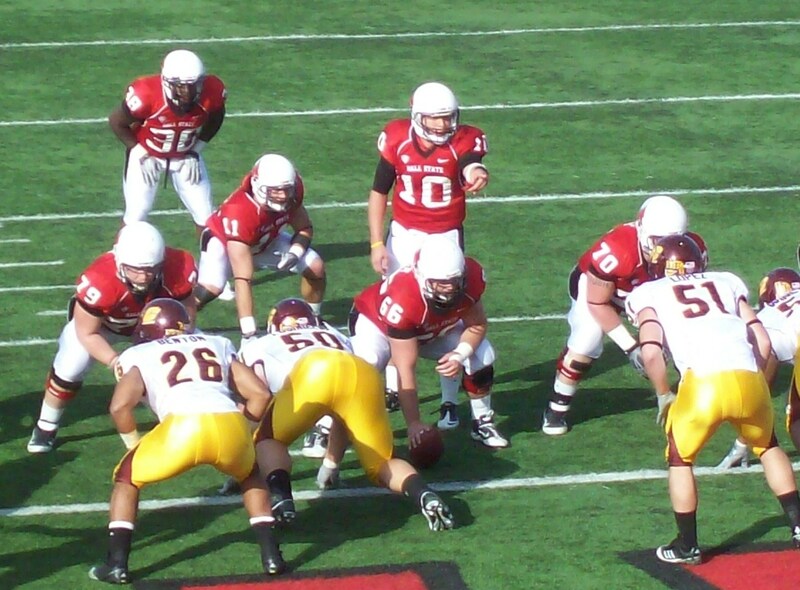 In 2007, Davis led the Cardinals to a 7-5 record and an appearance at the International Bowl against Rutgers. Most Cardinals fans erased that game from their memory as Ray Rice took a bazooka to the Ball State defense for 280 yards and four touchdowns. The 2007 season is also the year Ball State narrowly loss to Nebraska 41-40 in part to wide receiver Dante Love dropping a game-winning touchdown pass. With the history lesson out of the way time to look at the numbers. We can assume that Nate Davis is better but you know what happens when you assume. First observation has to be the yards Davis threw. Almost 900 more yards on 17 less completions. Davis was throwing downfield significantly more than Wenning. That is the difference between Dante Love and Briggs Orsbon as the No. 1 wide receiver. It is not a dig at Orsbon as Love is arguably the most explosive player in Ball State history. He was healthy for the entire season. Once Love was lost for the year in 2008, Davis was more conservative in his throws. That is why Davis threw for less yards his junior year. The 30-19 edge in touchdowns also can be attributed to a more aggressive passing offense with Love on the field. Wenning did not have a deep threat at wide receiver like Davis had in 2007. The Cardinals could not stretch the field playing into the hands of opposing defenses. Ball State also had some running back by the name of MiQuale Lewis in 2007 bringing balance to the offense. You may have heard of his name a time or two. Davis had a superior supporting cast and his numbers demonstrate that. Yet Wenning did an amazing job in achieving a higher completion percentage. Just imagine what it would have looked like if Dante Love was catching passes from Wenning. With a deep threat Wenning’s numbers will increase. The concern for Wenning is the interception numbers. He averaged almost a pick a game. Yikes! Playing Oklahoma inflated that stat a bit, but the turnovers have to come down next year for Ball State to improve. Looking back it is truly amazing how Davis was able to throw 30 touchdown passes and only six interceptions in a season. How did he not succeed in the NFL again? Bottom line, if a deep threat emerges at wide receiver to help out Wenning the next two seasons he can only progress (Willie Snead? Jack Tomlinson? Jamill Smith? Reggie Wayne? Wait… what?). I honestly thought Eddins was a bit crazy for thinking Wenning would be better than Davis after a loss to an FCS school at home. He played with both of them so he knows more than the rest of us. After the 2011 season though his prediction is still plausible. Wenning needs help from his teammates if he is going to do it, but two years from now we could view Wenning as the best quarterback in Ball State history.